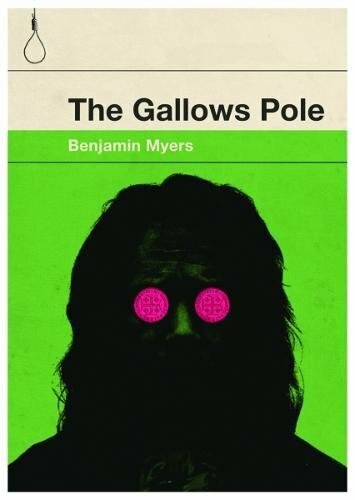 Set on the eve of the Industrial Revolution, Benjamin Myers’ latest novel The Gallows Pole combines radical politics with stark, beautiful landscape writing. A former Melody Maker staff journalist, Myers’ previous work includes a fictionalised account of the disappearance of Richey James and a Homeric song-cycle based on the life of Axl Rose, as well as the prize-winning novels Pig Iron and Beastings. He was a founder member of the Brutalist movement, alongside Tony O’Neill and Adelle Stripe. That’s difficult to answer as I’ve never really been sure of what has been expected of me. My parents certainly never pressured me into taking a safe career. I imagine some of my teachers and tutors at university would be surprised to discover that I am a writer of novels. I got 2 Ds at A-level and was flatly turned down by well over a hundred universities and colleges. Every single one in the UK in fact, apart from a former polytechnic in the home counties, where I managed to scrape a low-level degree in English Literature. I’ve never had an awful job for more than 3 days. It’s extremely hard to survive in this country doing things you enjoy, where property and the cost of living is high. But somehow, by working hard and eschewing certain things at certain times that other people might take for granted – alcohol, entertainment, new clothes – I’ve managed to survive through various forms of writing. A couple of years ago this very drunk, very obnoxious junkie-weasel man stole several packets of blue cheese, many bottles of wine and a stack of Parma ham from the local Sainsbury’s, punched his girlfriend in the face several times street and then ran to make his getaway by the train. But my wife, who was coming back from work, happened to be in his way as he ran down the platform, and so he missed it. He went full-on tonto and started throwing bottles at my her head. Glass was shattering all around her. She was terrified, and rang me very upset – “Some guy is trying to attack me” – so I jumped in the car, nipped down the road, and cornered him by the bus stop. I told him in what I thought of men who attack women, and he urinated himself, then the police came and arrested him. It wasn’t a creative achievement as such, but it did feel like the right thing to do in the moment. Also I’m proud of some of the books that I have written, and also one of my lesser-read works, a novella called Snorri & Frosti. When I was a teenager I was out walking alone up a fairly obscure mountain in the Lake District when, at a height of around fifteen hundred feet above sea level, I came across the opening to a tunnel. It was perhaps the entrance to an old slate mine. Being naturally curious I put my head-torch on walked into it. The tunnel went a long way into the rock, maybe a hundred yards or more, deeper and darker at which point it widened out into a large chasm, down whose craggy walls there dripped a slow trickle of water that pooled in one corner. My torch picked out a heaped pile of rocks in the middle of the water. A cairn. I turned my torch off and stood in absolute darkness until time seemed to slip away. I stood there for what felt like a long time. The only sound was the water on the rock – the wet echo of it, and a sort of perfect stillness in between those moments. The feeling was womb-like. But then suddenly behind me there was a noise, a suppressed cough, and a voice said my name. I thought it was imagined but then it said it again. I swung round and turned the torch on but there was nothing there except the walls of rock, the trickling water. Long shadows. Then I saw something that I hadn’t noticed before, in the middle of the pool on top of the cairn: a ram’s skull with full curled horns and large empty eye sockets. Obviously my inclination was to flee in utter terror, but I forced myself to wade out into the pool and I picked up the skull. Its teeth were loose in its in jawbone and I drew one out and took it with me. I got out of there bloody quick, glad to be back out on the fell-side. This was the experience that made me want to become a writer. I still have the tooth now, and had it preserved in a small cube of amber. It sits on my desk refracting the west-setting sun. I’ve been back to the tunnel but where the entrance was there is now a morass of boulders. It has been filled in. If you had to make a rap song boasting about your irresistible charm and sexiness, how would you describe yourself? I am 41 year old white male who lives in a terraced house in Yorkshire; I could never rap about my sexiness, though I did listen to a lot of early grime when I lived in Peckham from 2001. I still like to wash up to Oi by More Fire Crew. Maybe a bit of vintage Crazy Titch when I’m filing my accounts. When I was twelve I was approached in Eldon Square shopping centre in Newcastle by a casting director, who asked if I wanted to audition for a part for a BBC kid’s TV drama that was in development. Even though I had never acted a week later I went along, read some lines, did a scene or two and was surprised to be offered the part of a happy-go-lucky lad. They teamed me up with a boy of a similar age to form a sort of young, slightly comedic, double act. My character was ‘Duncan’ and his was ‘PJ’. The role of PJ went to a lad called Anthony who seemed nice enough – he had a bit of the Ernie Wise about him – but there was something about his face that made it hard for me to concentrate during rehearsals. I think it was his hairline, or perhaps his eyebrows, or maybe both together, but I kept fluffing my lines. It made me a bit paranoid actually; I felt as if his features were somehow colluding to get me kicked off the show. Every time I looked at his him I had a brain-freeze, often at key moments. Everything I had memorised so well in advance simply disappeared. Also at that time I was doing quite a bit of amateur boxing and writing a lot of short stories too, and knew that I fancied going in either one of those directions, but was also aware that at some point I would have to commit fully to one pursuit. So after another few more days of this, I saved the director the embarrassment of having to fire a twelve year old and resigned from the pilot episode of Byker Grove. I was replaced the following week by a boy with nice skin and floppy hair. I sacrificed a potential career in light entertainment, yes, but I retained my integrity. Even when he was off his head in the 1970s, Iggy Pop has always someone who has always radiated wit, charm and intelligence. He’s had money, lost money, made money, but all of that seemed peripheral to his art which, though inconsistent, is never dull. And now he’s a wise old soul. Boris Johnson is a ruthlessly ambitious schemer, a liar and a bandwagoneer who will say or do anything to gain career capital. I don’t think he cares about society at all, and even members of his own family are distrustful of his nebulous opinions. Nigel Farage operates at a whole other (lower) level and I know many people who would happily nail his tongue to a cricket bat, but Johnson pretends to be something he is not: a decent person. Farage can’t even hide it. They both need bursting. A ram’s tooth cast in amber. A clutch of peacock feathers. Six hats. Seven live rats. A pair of wine-red leather ankle boots. A slice of rock taken from Lumb Falls, West Yorkshire. A suitcase full of old letters. A bass guitar and a small amplifier. A blanket bought in Mexico. My house keys. A dehumidifier. A spool of piano wire. An exotic gourd. My wife’s Russian military coat. Some spoons. Two small figurines depicting Thor. A USB stick. Paracemetol. A small flask of Turkish tea. Oatcakes. A packet of seeds. I often quote Charles Bukowski’s epitaph – “Don’t try” – but I think you should have a go now and again. Unless you don’t want to. Film: My Best Fiend by Werner Herzog. Posted in Interviews and tagged benjamin myers, momus questionnaire. Bookmark the permalink.